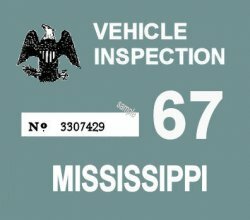 1967 Mississippi inspection sticker - $20.00 : Bob Hoyts Classic Inspection Stickers, Add a Final Touch to your Restoration! 1967 inspection sticker year for the state of Mississippi is taken from a very badly decomposed original. Based on what information we have this is a very close reproduction. We welcome original stickers in any condition or even pictures so we can update our inventory images.